From the summer of 2016, it was announced that Chinese people didn’t need visa anymore to go to Morocco. It was such a great news that the notion of traveling there was breed. When I was living in Inner Mongolia, my family went to Muslim restaurant often and since then we had an affinity to the people . Also under the influence of Chinese writer Sanmao, who lived in Canary Islands, West Sahara and recorded her interesting life there, I was always looking forward seeing the beauty of this mysterious country. Morocco is quite closed to Spain. Within 2 hours, I arrived at Tangier from Barcelona. The airport of Tangier was very small. After registration, a taxi carried me to the city centre. I chose to live in Airbnb of a residence. The owner was very helpful. He took me to a market next to his house and had lunch in the market. There were fried seafood, soup and various dishes of starter. The bread here was alike the bread of Chinese Muslim but much softer. Only 40 dirham (4€) of food made me full. In the afternoon I took a walk in the Medina. The Median looked similar to the old centre of Sevilla but poor and unorganised. On both sides of the main road, tiny shops and stands full of agricultural products and crafts could be found. Medina was the old city and only paths were narrow roads, so soon I lost my direction because sometimes it lead to a dead end. Then some young people saw my confusing face then came up and asked “Hello my friend where are you going?” I was so scared and said nothing but tried a way out. As I travelled alone, anything could happen if I followed them. Thank goodness I returned on the main street. On the way home I tried a lot of local snacks and bought some fruit. When the sun went down, I remembered that a friend warned me not to go out late. So I had a rest very early. On the second day, I went to the Medina again. But this time, I encountered a French couple then I request to join them. First we went to the corner of the Medina which used to be a castle called Kaspah. Later walking through the whole castle, we reached the market area. The products in Morocco were similar to Spanish ones. I was only attracted by argan oil. It was abstracted from a famous Moroccan plant and used in cosmetic way. Kérastase best seller contained this oil. Here the price was reasonable and I was moved totally. Then during the midday we separated and I was trying to find a good restaurant featuring Tajine. Without map, I didn’t know its exact address. Luckily there were some girls students after school. They took me to the cafe with the same name and invited me Moroccan mint tea. From this cafe, the Straits of Gibraltar could be taken all in a glance. Even Tarifa of Spain could be spot in clear days. Among these girls, not everyone wore a scarf. The society of Morocco has opened gradually. When it came to lunch time, they went home while I entered the restaurant. It was the pity that Tajine was not available in the midday, so I ordered a dish of mixture of 5 Moroccan salads and mix shashlik. It was so yummy and similar to Chinese Muslim food. Then I returned to my place and had a rest. In the evening I encouraged myself to have a look outside. Tangier downtown was safe actually and the night life was interesting! I was almost the only tourist in this residential area and tried plenty of street food. All the people were looking at me but treat me with no difference. This was my style, “ground connection” style! On the third day, a bus took me to the well-known blue town Chefchauen. Before I came to Morocco, I did worry about my security. Every time when the bus went into a city, there was police stopped cars and checked them randomly. No worries at all! When arriving there, it was noon already. So I had lunch at a local eatery. It was even dirtier but cheaper. Chefchauen was a small town painted all in blue and white to attract tourists. Therefore I was a little bit down cuz this was too pretentious. However it was more peaceful then Tangier. Spanish travellers could de found everywhere. There I met cute kids asking me for taking photos with them. They were pure and innocent not like the kids in the Medina. The Medina of Chefchauen lied against the mountain. Pretty handcraft stores were here and there. In the end of the Median, a stream ran from the valley. I was afraid of getting lost again, but it wasn’t big and soon I got on the return bus. During the night I went to the street food again. The owners were so happy to see me again and called me “monsieur”. Almost I had discovered all Tangier, so on the fourth day I took a 5-hour train to one of the four holy cities, Fes. On the way, Atlantic ocean, grooming meadow and hills passed by. Due to it was 31 of December, I took first class to obtain a seat. Regardless of 5 hours, the whole trip was comfortable. At 3:30 the train arrived on time. In order that I wouldn’t be cheated for an incredible price, I walked 6 km to the Fes Median where I stayed for 2 nights. The Median was so huge and I lost my way. Fortunately I found my hostel by myself. The hostel AKA riad was a traditional Moroccan house with several big rooms and a balcony. All the rooms were decorated by mosaic patterns. How great experience I had! When settling down, immediately I immersed myself into the grand Medina maze. Here I could see tourists from all around the world. No doubt the Medina was extremely commercial. The stores had not only local merchandise but also clothes and shoes made in China. The price absolutely was more expensive than Tangier. The people were also crafty and foxy. Successfully one of them fished me to enter a crazy expensive restaurant. Excused by a reason, I escaped this disgusting place and had dinner in a kind-face old man’s eatery. There were only two Moroccan customers so I reckoned that it should be a place for folks. So it was. I had a good and cheap meal here. The next day in the morning, I met a group of Chinese visitors who had a local guide. The guide saw me with a grey face. Then I asked to join and said that I could pay 50 dirham for him. He answered “It’s fine that you join in but you should tell me first. Come.” He narrated the history of the architectures and functions of the constructions. Meanwhile as a guide, absolutely he took us to stores, such as scarf shop, leather shop and medicine shop. I was not good at bargaining so I didn’t buy anything though I loved the leather products and scarves. Being a culture vulture, I wanted to see the inside of mosques but it was only allowed for believers. Such a pity— the mosques were full of art and stories! Fes Medina, the organisation was in perfect order. The markets of food, of sweets, of clothing, of furniture, of pharmacy etc were settled clearly. By the end of tour, the guide asked me for extra money. All of us were shocked for he really did so. Then we separated. For lunch, I had a chickpea soup. It was not tasty nor bad. All the food was curious. Then in the afternoon while discovering, I was cheated by a so called “private guide”. That was the risk of being alone in a unfamiliar place. In order to keep safe, I spent a long time in the hostel roof enjoying the city view instead of waking in the city. The sixth day I returned to Tangier by train. In the afternoon, finally it was the time for shopping. However I only left little money for tea and food. At night, I ate the highly recommended Tajine with chicken for the first time. It was super delicious and similar to northern Chinese stew chicken. In the following morning, suitcase was ready. After the morning tea, I flew back to Barcelona. In deed this journey was a real adventure. I don’t speak Arabic nor French. Only with poor expression of French and body language, I made it to communicate with the people. Even though there were moments of frightening, I enjoyed so much. I can’t even wait for the next tour of Morocco! from Tangier to Fes by train 111 Dirham one way. Do not listen or follow any young guys or kids in the medina who is willing to guide you. They just wanna tips. Do not try the street food if you don’t have a good stomach. Girls do not travel alone there. To save it´s better to have meals in the small eatery where you can see local people. The temperatures change fast in Fes. 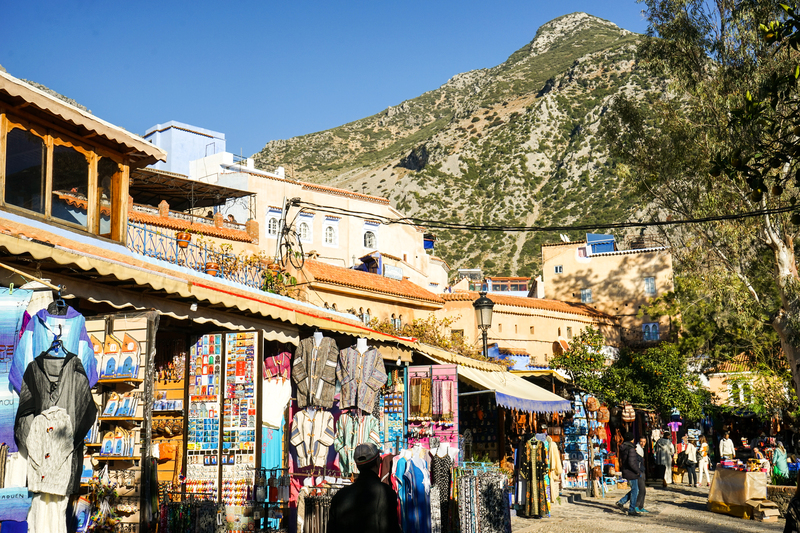 The common languages in Morocco is Arabic and French, but in Tangier Spanish is practical. Des del verano de 2016, los turistas de China no necesitamos el visado para ir a Marruecos. Es una gran noticia pues he tenido el plan de viajar allí. Cuando estuve viviendo en Mongolia Interior, mi familia y yo íbamos al restaurante musulmán a menudo. Desde aquel momento, nos ganamos la simpatía de los musulmanes. También a causa de la influencia de la escritora Sanmao, la cual vivió en Gran Canaria, en Sahara Oeste y escribió un libro sobre el Norte de Africa, deseaba ver la otra parte del planeta. Marruecos está muy cerca de España. En dos horas llegué a Tánger desde Barcelona. El aeropuerto de Tánger era muy pequeño. Después del registro, cogí un taxi al centro de la ciudad. La vivienda era de Airbnb y estaba situada en la zona residencial. El dueño era muy simpático y me llevó a un restaurante en un mercado al lado de casa. Había marisco frito, sopa y varios aperitivos. El pan marroquí era parecido al pan chino musulmán pero más suave. Sólo por 4€ estuve lleno. Por la tarde, di un paseo por la medina. La medina era como el centro de Sevilla pero parecía caótica y pobre. En ambos lados de la calle principal había tiendas artesanales y puestos de frutas. La medina era muy antigua y solamente se conectaba con callejones, pues pronto me perdí por ellas. Entonces, unos jóvenes me vieron y me preguntaron “¿Adónde vas amigo?” Me dieron mucho miedo, no dije nada y me fui. Como viajaba solo, cualquier cosa podría pasar si les seguía. Al volver a casa, probé muchos tentempiés y frutas que había comprado anteriormente. Cuando el sol se puso, recordé que no era mejor no salir por la noche y me quedé en casa. En el segundo día fui a medina otra vez, pero encontré una pareja francesa y me uní a ellos. Primero, fuimos al rincón de la medina donde había un castillo llamada Kaspah. Después de atravesar el castillo, llegamos al mercado. Los productos de Marruecos eran similares a los de España. Sólo me interesaba el aceite de argán. Se hacía con una planta famosa marroquí y es utilizado como producto cosmético. Aquí el precio era razonable por lo tanto tuve ganas de comprarlo. Al mediodía nos despedimos y me fui a buscar un lugar para comer tajine. Sin mapa, encontré dificultad de la dirección pero unas estudiantes me llevaron al café caeca y me invitaron a un té. Desde la terraza del café, pude hacer una vista al Estrecho de Gibraltar. Se decía que era posible ver Tarifa desde ahí cuando hiciera sol. Ahí no todas las mujeres llevaban pañuelo. La sociedad se va abriendo poco a poco al mundo. A la hora de comer, ellas fueron a casa y yo me fui al restaurante. Fue una lástima que no se sirviera tajine en aquel momento, entonces pedí una ensalada mixta y pinchos. ¡Qué deliciosa y parecida a la de China! Luego, volví a casa a descansar. Por la noche me animé a echar un vistazo fuera. El centro de Tánger era seguro en realidad y ¡la vida nocturna era interesante! Yo era el único turista en esta zona residencial y probé un montón de comida de la calle. Toda la gente me miraba pero me trataban con total indiferencia. Éste era mi estilo, el estilo “Conexión a la Tierra” jajaja. El tercer día, un autobús me llevó al pueblo azul, Chefchauen. Antes de venir a Marruecos, me preocupé mucho por la seguridad. Cada vez cuando un vehículo entraba a la ciudad, la policía le detenía y le hacía un control. ¡Pero no me preocupé ni lo más mínimo! Al llegar, ya era mediodía, y comí algo sencillo en un sitio que se servía comida muy barata, pero aún más sucia a mi parecer. Chefchauen era un pueblo pintado todo de azul y blanco para atraer a los turistas. Por eso, mi ánimo estaba un poco por lo suelos porque esto me pareció demasiado pretencioso. Sin embargo, el ambiente era mucho más tranquilo que en Tánger. Había turistas españoles por todos los lados. Aquí, unos niños locales me pidieron sacar fotos con ellos. Ellos eran puros e inocentes mientras que los niños en la medina eran astutos. La medina de Chauen estaba apoyada contra la montaña. Había bastantes artesanías repartidas por allí. Al final de la medina, un arroyo corría por el valle. Tenía miedo de perderme de nuevo, pero la medina no era grande y pronto me subí al autobús de regreso. Durante la noche fui a comer a la calle otra vez. Los propietarios estaban tan contentos de verme, me saludaron y me dijeron “señor”. Apenas había descubierto todo Tánger, y el cuarto día tomé un tren e hice un trayecto de 5 horas hacia la ciudad real, Fez. En el camino, se divisaban el océano Atlántico, la pradera y las colinas. Debido a que era 31 de diciembre, cogí un asiento de la primera clase. Quitando las 5 horas de trayecto, todo el viaje fue muy cómodo. A las 15:30 de la tarde el tren llegó a tiempo. Para que no me engañaran los conductores de taxi, caminé 6 km hacia la medina de Fez donde me alojé dos noches. La medina era enorme e increíble y por cierto, me perdí. Afortunadamente encontré el hostal también llamado riad. El hotel era una casa tradicional marroquí que contenía muchas habitaciones grandes y un balcón. Todas las habitaciones estabas adornadas con mosaicos. ¡Qué gran experiencia tuve! Después de dejar la maleta, inmediatamente me metí en la medina. Allí había turistas de todo el mundo. Sin duda, la medina era muy comercial y se vendían artículos no únicamente locales sino que también de China. El precio, sin duda alguna, era más caro que en Tánger; la gente era más lista y calculadora. Finalmente, uno de ellos me engañó y entré en un restaurante carísimo. Por una excusa me escapé y fui a un lugar donde había un simpático abuelo. En este sitio solamente dos residentes comían, por eso pensaba que era un lugar “normal”. Sinceramente, ese restaurante servía comida rica y barata. La siguiente mañana, tropecé con un grupo de chinos que tenía un guía local. El guía me vio con una cara gris, entonces le pregunté si podía unirme al grupo, eso sí pagando más dinero. Me respondió “tendrías que haberlo dicho desde un principio. Venga, vamos.” Nos narró la historia de la arquitectura y la fonación de la construcción. Por supuesto, nos llevó a tiendas de bufandas, de cuero y de medicinas. Como fan de la cultura que soy, tenía ganas de ver los mosques pero no se pudo. Los mosques era para los creyentes solamente. ¡Que pena!” tantos tesoros y historias estaban ahí dentro y yo me las perdí. La medina de Fes estaba perfectamente organizada. Los mercados de comida, de dulces, de ropa, de muebles, de medicinas etc. todos ellos estaban completamente ordenados. Al final de la excursión, el guía me reclamó una cantidad de dinero extra. Todos nos quedamos sorprendidos porque realmente lo hizo. Luego nos separamos. Para el almuerzo, tomé una sopa de garbanzos. No era sabrosa pero tampoco estaba mala. Toda la comida era curiosa. A continuación por la tarde mientras descubría más sitios, fui engañado por un supuesto “guía privado”. Ese era el riesgo de estar solo en un lugar desconocido. Para la seguridad, pasé toda la tarde en el balcón disfrutando de la vista de la ciudad en lugar de caminar por la ciudad. El sexto día volví a Tánger en tren. Por la tarde, me fui de compras. Sin embargo, me quedé poco dinero para el té y la comida. Por la noche, comí el recomendado Tajine con pollo por primera vez. Fue super delicioso y similar al pollo guisado chino del norte. A la mañana siguiente, la maleta estaba lista. Después de un vaso de té, volé de regreso a Barcelona. De hecho, este viaje fue una verdadera aventura ya que no hablo ni árabe ni francés. Sólo con una pobre expresión del francés y del lenguaje corporal, me las ingenié para comunicarme con la gente. Aunque hubo momentos de miedo, disfruté mucho. ¡Estoy impaciente por volver a Marruecos! desde Tánger a Fez en tren 111 Dirham de ida. No siga a ningún chico o chico joven en la medina que esté dispuesto a guiarlo. Sólo quieren propina. No pruebes la comida de la calle si no tienes un buen estómago. Las chicas que no viajen solas por allí. Para ahorrar es mejor tener comidas pequeños restaurante donde se pueda encontrar con la gente local. Las temperaturas cambian rápidamente en Fez. Las lenguas comunes en Marruecos son el árabe y el francés, pero en Tánger el español es práctico.